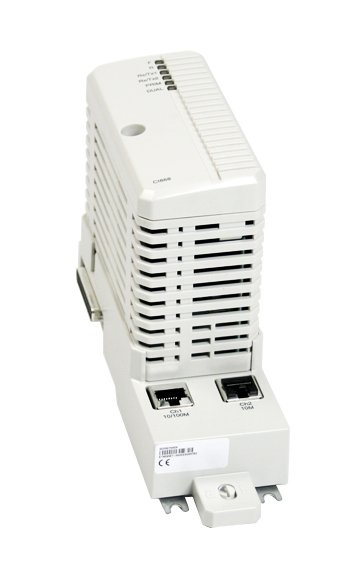 The CI868 can be used to connect an AC 800M controller to external Ethernet devices using IEC 61850 –Edition 1 standard. Since this is a standard for Substation Automation, this allows the combination of Process Automation and Electrical Control in the same controller. The TP868 Baseplate has two RJ45 Ethernet connectors, where CH1 connector can use 10Mbps or 100Mbps (Mega bits/sec. ).The baseplate has a code lock that prevents the installation of an incorrect type of unit onto the TP867 Baseplate. The CI868 expansion unit contains the CEX-Bus logic, a communication unit and a DC/DC converter that supplies appropriate voltages from the +24 V supply via the CEX-Bus. The Ethernet cable must be connected to the main network through an Ethernet switch.